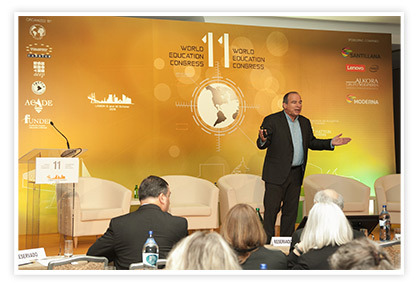 On 09th and 10th October 2015 in Lisbon, Portugal, was held the XI World Congress of Education: "The New Education in the Digital Age", organized by the World Confederation of Education (COMED); the European Association of Private Education (CADEICE); the Federation of Educational Associations of Private Education of Latina America and the Caribbean (FAEPLA), the Association of Private Institutions and Cooperative (AEEP) and the Association of Autonomous Centers of Private Education (ACADE). COMED“s authorities with representatives of different countries. 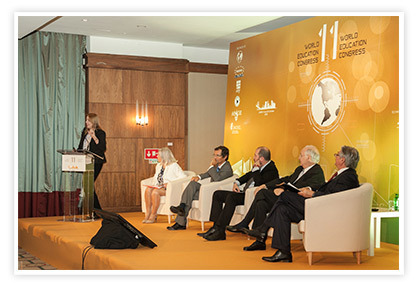 This edition of the Congress was attended by representatives of more than 200 educational organizations worldwide, comprising over 75,000 centers in the classrooms more than 28 million students are educated each year; and the Minister of Education and Science of the Republic of Portugal, Paulo De Sousa Nuno Crato Arrobas. 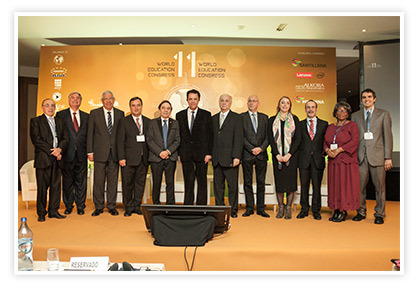 The President of COMED, Edgardo N. De Vincenzi, together with Minister of Education and Science of the Republic of Portugal, Paulo De Sousa Nuno Crato Arrobas; and COMED’s authorities. 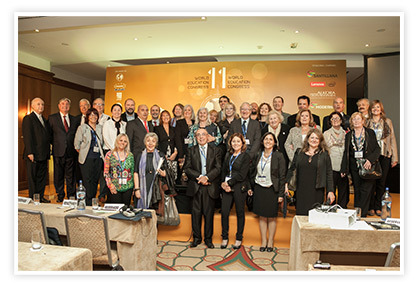 During the same the institutions present committed with the principles of inclusive education with quality and equity reaffirmed, giving support to the Ministerial Declaration of Lima and Goals 2021 of the Organization of Ibero-American States (OEI) ; and recognizing education as a fundamental human right, and the Freedom of Choice as an inherent condition to it. For this, the development of teaching strategies and institutional arrangements that promotes learning to learn, learning to undertake, intellectual cooperation, creative intelligence and intelligent emotion, accompanied by the implementation of a curricula that support the development of skills personalizing personal and social institutions. 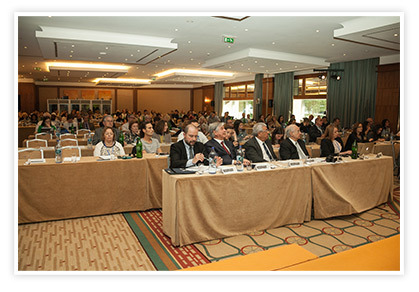 Educational innovations are crucial for anticipating responses to emerging problems and offer new solutions to the outstanding issues, and the climate of innovation can only be generated within a framework of pedagogical and curricular freedom, so it is necessary to create and promote a professional culture in the teachers and educational institutions, allowing an ongoing reflection and debate on innovation and educational change, with a smooth exchange of experiences among all countries. Members of COMED, FAEPLA, CADEICE and ACADE. This process of incorporation information and communications technology in education in order to improve the teaching and learning must be accompanied by a thoughtful analysis as it seeks to promote multiculturalism and diversity as an inherent component of quality education. Education, drawing on the richness of diversity, should, through innovative teaching and learning processes contribute to a fuller human development and a source of understanding, pluralism and social cohesion. Meetings of common interest carried out by a moderator of maximum prestige. - “The profession of weaving dreams: teaching in the 21st century” by Sir John Jones. - “The creative school: of learning to learn to learn to create” by Carla Rinaldi. - “To educate with talent” by José Antonio Marina. - “Neuroscience and New Education” by Alexandre Castro Caldas. - “Education for a new age. Steve Jobs Schools” by Maurice de Hond. - “Invisible learning. Towards a new ecology of the education” by John Moravec. - “The liquid modernity. Three principal challenges of Education in the new society” by Zygmunt Bauman. International experiences: We will have a selection of the best educational Centers of the world, that they will go to the attendees of the Congress their excellent experiences to show us. 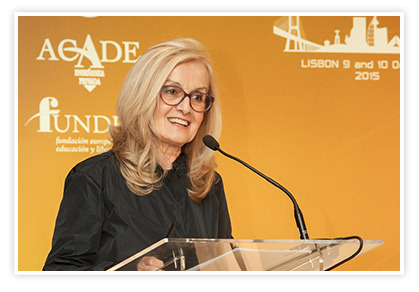 Colegio Pedro Arrupe (Lisbon, Portugal) – Ana Mira Vaz, Director. 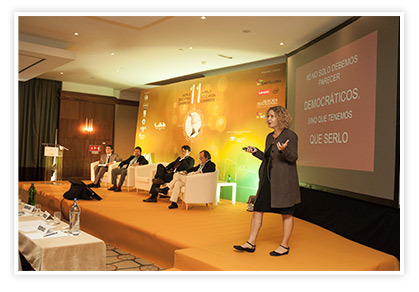 Colegio Montserrat (Barcelona, Spain) – Nuria Miro, Director. 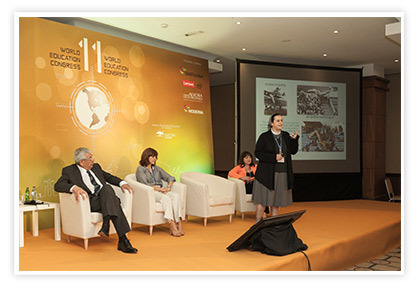 Grupo Educativo Unis (Varginha, Brazil) – Carol Garcia, Director of International Relations. Nora Pinedo - Director General of Private Education of the Province of Buenos Aires, Argentina. Rodrigo Queiroz e Melo - AEEP’s Executive Director and CNEF’s Director. Hernan Herrera Russell - President National CONACEP (Chile). Nadia Czeraniuk – FAEPLA Paraguay’s Director and President of UNAE, Paraguay. Helio de Lamos - Vicepresident 1° (Reg. Central America) of FAEPLA, Venezuela. Jorge Cifuentes - Vicepresident 2° (Reg. Andina) of FAEPLA, Chile. 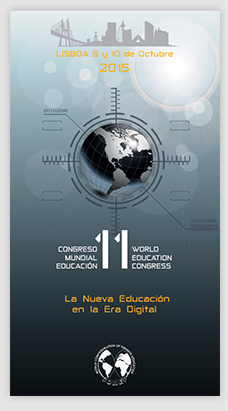 Francesc Pedró (by streaming) – Head of the division of sectorial policies, ICT and Education of UNESCO. Innovation Lab: Space created for the research, design and presentation of the most innovative offers of the educational world. New methodologies that are changing the world of education. 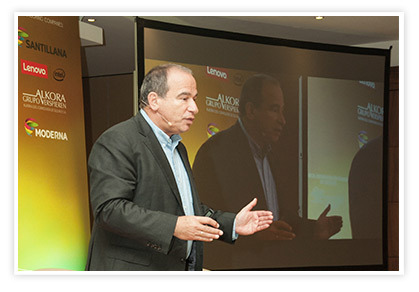 Alberto Ruano, Director General’s Lenovo Portugal and Chief Enterprise Lenovo Iberia. Enrique Celma, INTEL Education Director. María Acaso, Professor and researcher at the Complutense University. Miguel Barrero, Director General of Digital Business of Santillana. Moderator: Ezequiel Mateo Martinich, Coordinator of International Cooperation Universidad Abierta Interamericana. 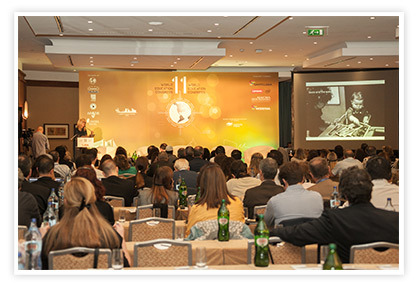 Masterclass: Special sessions, taught by the most prestigious speakers from Congress, for a small number of attendees in a practical and interactive format. 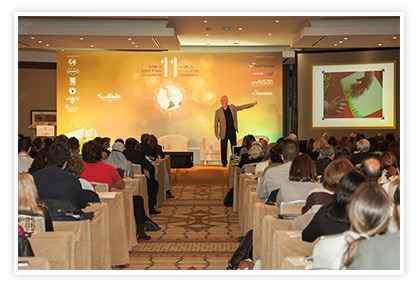 Welcome speech and Keynote speech: The new education in the digital age: Personalizing School. 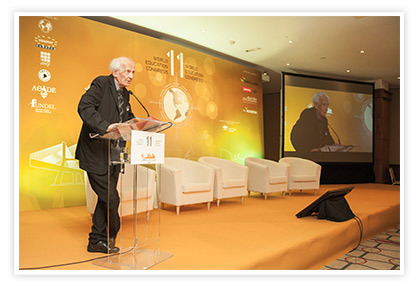 Prof. Dr. Edgardo N. De Vincenzi. 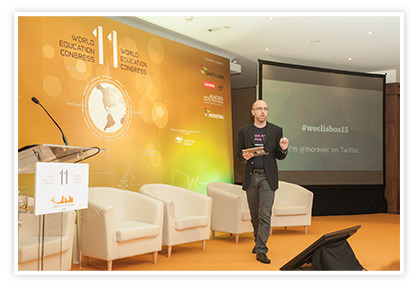 Innovation Lab: New methodologies that are changing the world of education. Moderator: Lic. Ezequiel Mateo Martinich. 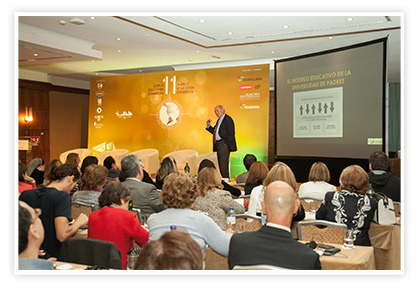 Experiences of success: Colleges of Portugal, Spain and Southamerica. 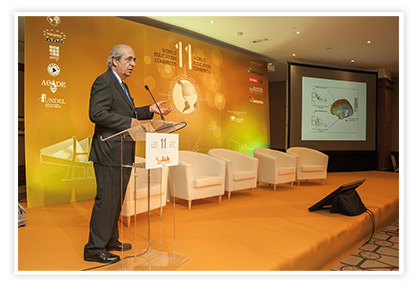 Prof. Nuno Paulo De Sousa Arrobas Crato - Minister of Education and Science of the Portuguese Republic. Lic. Jesús Núñez – President of the Association of Autonomous Centers of Private Education (ACADE). 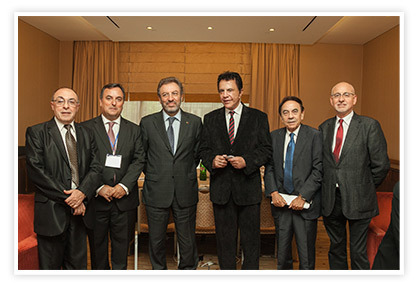 Prof. Dr. Edgardo N. De Vincenzi - President of COMED (World Confederation of Private Education) and FAEPLA (Federation of Educational Associations of Private Education of Latina America and the Caribbean). Conference: “The profession of weaving dreams: teaching in the 21st century” by Sir John Jones. - Member of the National College of School Leadership and Leadership Development Unit in UK. Helio de Lamos - Vicepresident 1º (Reg. Central America) of FAEPLA, Venezuela. 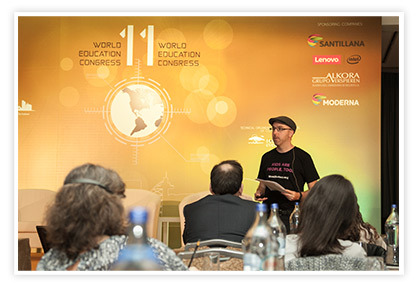 Francesc Pedró – Head of the division of sectorial policies, ICT and Education of UNESCO. “The child is a real investigator... Nevertheless, it is possible to destroy this attitude with our answers”. “To educate with talent” by José Antonio Marina. Director of the Institute of Health Sciences of the Portuguese Catholic University. He has been Professor of Neurology at the Faculty of Medicine of Lisbon and Director of the Neurology Department of the Hospital de Santa Maria, Lisbon. He was President of the International Neuropsychological Society (2000-2001). COMED Annual Assembly. (For members of the Board of COMED). Masterclass: Maurice de Hond (optional). “Education for a new age. Steve Jobs Schools” by Maurice de Hond. Every child set their own schedule and time advised by their teachers, who in the Steve Jobs Schools are call “a trainer”. This way, the child goes to different “places” (place of languages, creative workshop, workshop of numbers, technical laboratory) according to their particular characteristics. Moderator: Ing. Luis E. Franchi. “The technological change stimulates the social change, and its impact is hastening of exponential form. Our schools, universities and other institutions must generate a jump improve to be able to compete in a society based on innovation”. “Young people coming out of universities in this time of crisis were educated on the idea that study provides them a good social arrangement. And yet, not were prepared to be immersed in a society of rapid changes. It has also produced a loss credibility of pedagogical tools used so far. The own learning of a world enduring does not apply to a changing environment. The memory, system of traditional education, seems now a secondary component. The educational effort bears no strongly correlated with social success. And culture is no longer a “solid” of knowledge, but something fleeting, changing, set “Liquid”. Reading conclusion of Lisbon’s Declaration: Lic. Javier Hernández y Lic. Perpetuo Lentijo. Reading of UAI Superior Council’s Resolution: Lic. Perpetuo Lentijo. Emerit’s Rector and COMED’s President words: Prof. Dr. Edgardo N. De Vincenzi. Delivery the Doctorate. Closing Cocktail and award the Prize “Best Innovative experience of the XI World Education Congress 2015”. 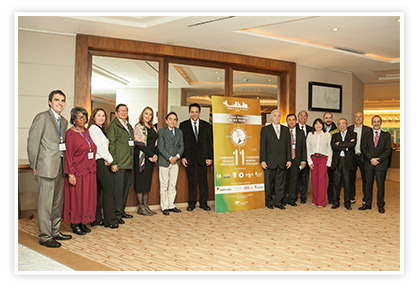 Authorities and assistants after the Closing Ceremony of the XI World Congress of Education. FUNDEL: European Foundation Education and Liberate. AEEP: Association of Private Institutions and Cooperative. Centro Universitário do Sul de Minas - Brazil. Embassy of The State of Qatar, Lisbon, Portugal. Foro Europeo Educación y Libertad (FUNDEL). Universidad Autónoma de Encarnación - Paraguay. University of Central Arkansas - United States of America. Universidad San Pablo (Tucumán) - Argentina. Dirección General de Planeamiento, Evaluación y Control de Gestión de la Provincia de La Pampa - Argentina. Secretaria de Políticas Universitarias del Ministerio de Educación de la Nación - Argentina.